(~10.2 kilometers) Between 5 and 6 hours. Add some time for stops. Difficulty: 6/10. Quite long and the dry trek part has lots of nasty foliage (nicks and scratches). This can be done as either a dry (you won't get wet) or wet trek. About 115m total ascent. 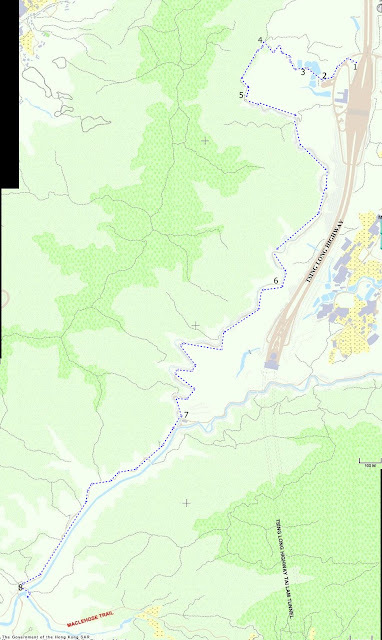 Cel phone coverage: Everywhere on the trail, nowhere on the stream (don't get lost). Appreciation: 5/10. A bit of two minds about this one as the waterfall at the end is quite nice but the trek to get there is not great. If you go only for the waterfall at the end, might be better to do it in reverse. 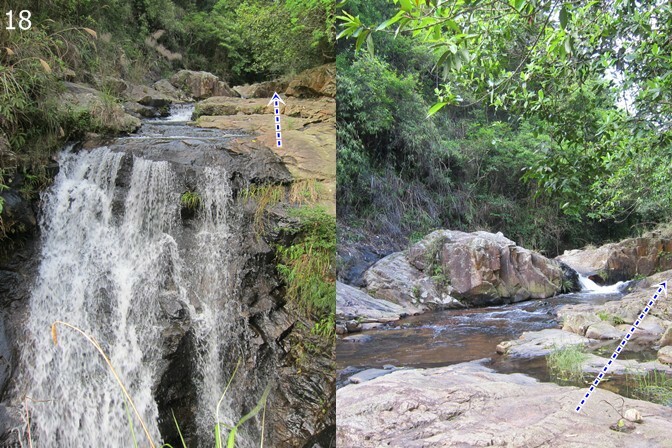 Water is also quite dirty compared to other waterfalls with pools in which you can swim. The Ping Nam stream trek is in my opinion much better. 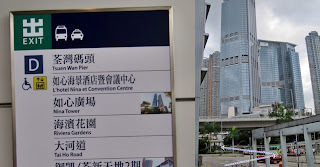 Transportation: Seems that the widest variety of bus routes are from the Tsing Yi MTR stop. Take KMB bus 251M, 263M, 264M or 265M (http://hketransport.gov.hk). 20 minutes ride to destination. Stop at 大欖隧道 TAI LAM TUNNEL. At the end of the trail in Sham Tseng (), just get to the bus stop in front of Rhine Gardens and there will be 234A, 52X, 63 getting you to the Tsuen Wan MTR. There's also quite a few other bus options to get you anywhere you want. At Tsing Yi MTR station, take exit 'A' to get to the bus terminus. Take one of the numerous buses going through Tai Lam Tunnel. The bus stop is right after the Tai Lam Tunnel (大欖隧道 TAI LAM TUNNEL). Right behind the stop, your hike starts. Follow the path, then cross the road and head left. There will be a minibus stop at a short distance. 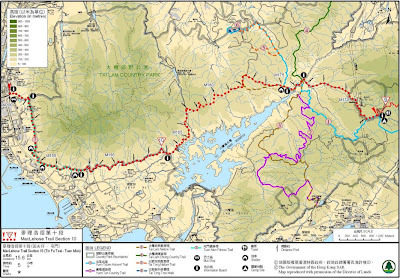 The trail proper starts there with the Tai Lam Chung Country Trail trail-head. A map is in a little toilet building (#2). Go through. 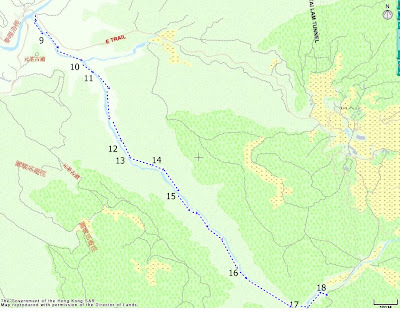 Refer to the numbered pictures on the map. Click to enlarge. Path is a little bit messy behind the toilet. Just head a little bit leftward and after about 20 meters, you'll hit the C6401 milestone (#3). Follow the path and climb until you reach an intersection (#4), head left. After 10 or so minutes walk, you'll reach #5 which is where the trail reaches the catch-water paved road. It's not the most interested trek but is really easy. You'll be on it for a good 45 to 60 minutes. At this point, there's an intersection. You will want to head right and follow the road that climbs up. From this point on, you have another 25-30 minutes to go. Arrived at the Kat Hing bridge (吉慶橋). 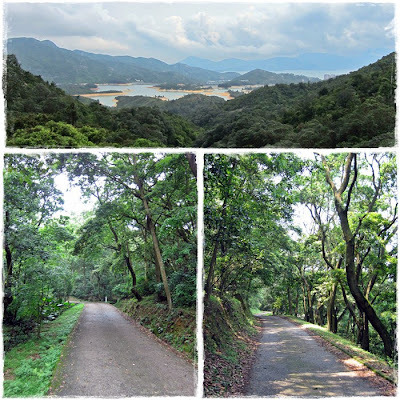 This is also part of the MacLehose trail (Section 10). Cross the bridge and right after, head into the stream, on the right. The stream trek is starting there. Head left. 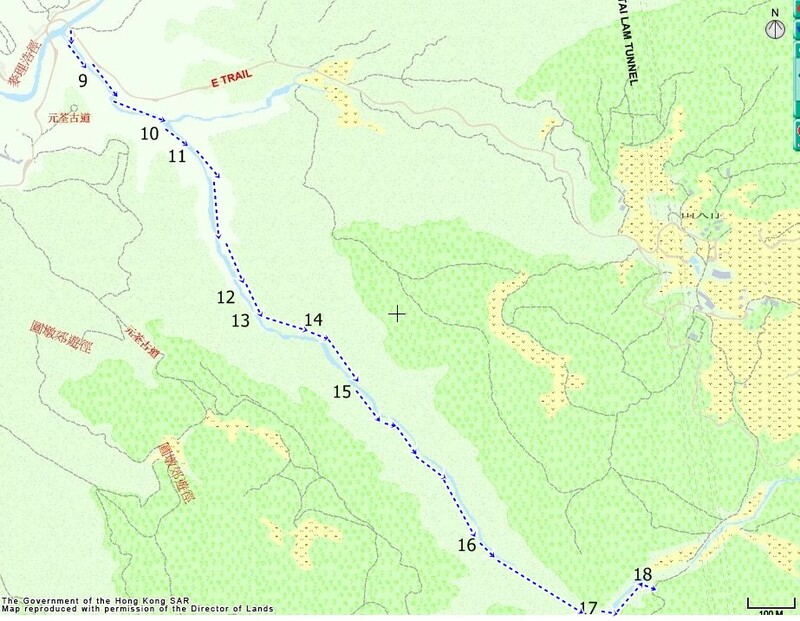 Stay on the right of the stream for 50 meters, then left for another 50 meters. You should eventually see red pieces of ribbon attached to the trees. Follow those as they will be great indicators of which side of the stream to be on. Otherwise, well, it's going to take longer. Be mindful of those long blades of foliage along the way, I got a few cuts from them. The edges are made of hundreds of little teeth. The Lotus Stream portion. Click to enlarge. Keep following the red ribbons. But, as a rule of thumb, if it seems to be too dangerous, that's probably because you're on the wrong side of the stream. About 25 minutes in, you'll reach a point where the stream branches to the right and left. While the left side seems easier and more inviting, you must continue to the right. This was the least pleasant part of the trek as far as I'm concerned. Go through the bushes on the right at this point. Red Lotus Cliff (紅蓮絕壁), about an hour and 10 minutes walk after having entered the stream. 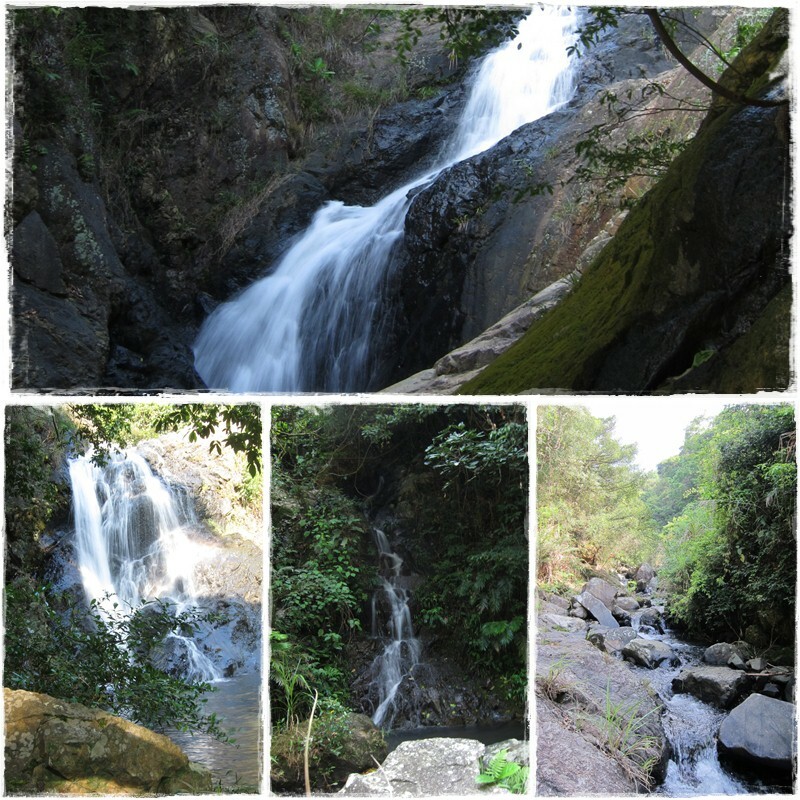 Red Lotus Rainbow falls (彩瀑紅蓮). Don't worry, the climb on the left is quite easy with big steps, and not dangerous. Lotus Terrace Fall(蓮台飛渡). Again here, easy and safe climb on the left. No need to be experienced. It just looks worse than it really is. Lotus Rock(蓮台石). About 2 hours into the stream trek. Keep trekking for another 25 minutes or so and you'll see this small waterfall on your right. 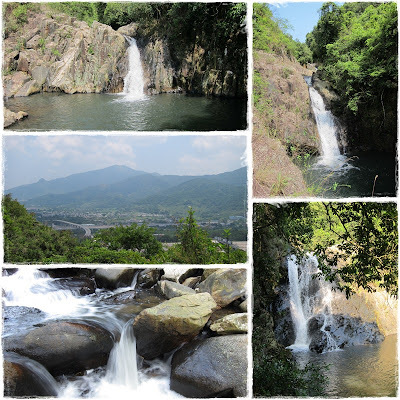 Another 15 minutes walk and you are almost at the end of the stream trek, at the foot of the Hidden Valley of Fairy Lotus falls (幽谷仙蓮). Good time for a short break, a sip of water and who knows, maybe a swim if you are so inclined. When you are ready to go, head left and climb the ridge that follows the waterfall. After the second stretch of the falls, you will need to be crossing the stream. Crossing there is a little bit tricky and after a rainstorm, most likely not possible without getting wet. Very pretty. Climb the rocks on the right. Not too difficult. At the top of the falls, you are mostly done. If you try to continue in the stream, you will have to get yet because there's no dry way to go around. If you do decide to get yet an follow the stream, you will keep going until you hit a small bridge, that's the end and that's the trail. You can head right on the trail. However, I suggest that instead, you keep right at the top of the waterfall. After about 20 or so meters, you will see a roughly defined path on the right that climbs up the hill. Take it and it will lead you to the trail. Actually, you can't really get lost if you keep going straight up because the trail parallels the stream, then cut it. There's a big rock, everything is ok, don't worry, you're not lost. End of the off-trail trekking. Once you have reached the trail, at the top of the hill, head right. From this point on, you are about 45-60 minutes away from the end of the trail in Sham Tseng ( 深井). 5 minutes after you have been on the trail, you'll reach the road/bike path, milestone C6112. There's a toilet there if need be. 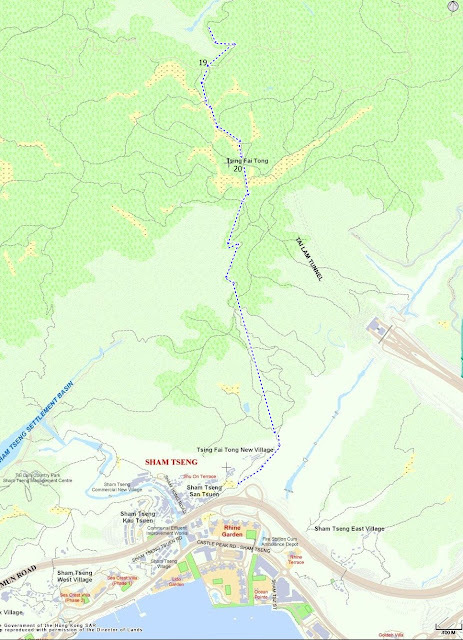 At this point, you'll turn left in direction of Tsing Fai Tong Village. 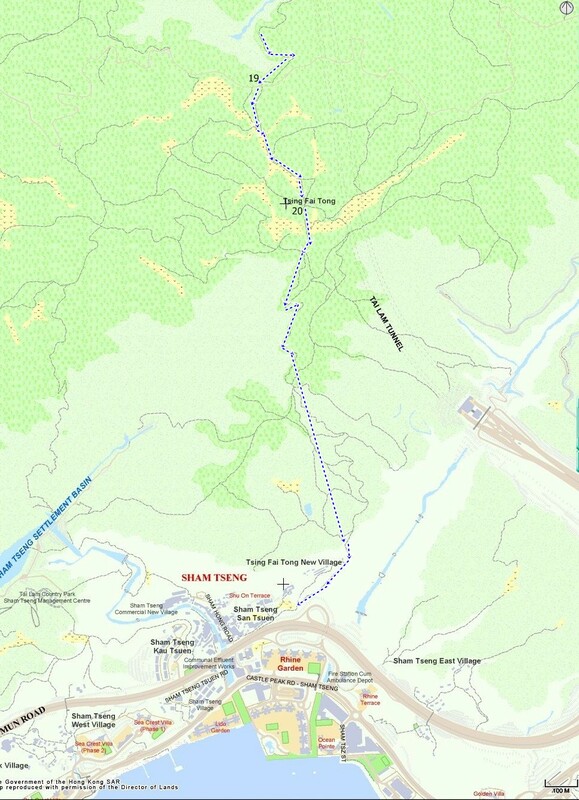 You will reach Tsin Fai Tong in about 15 minutes. Follow the signs to Sham Tseng. Quite easy afterwards; just follow the trail. 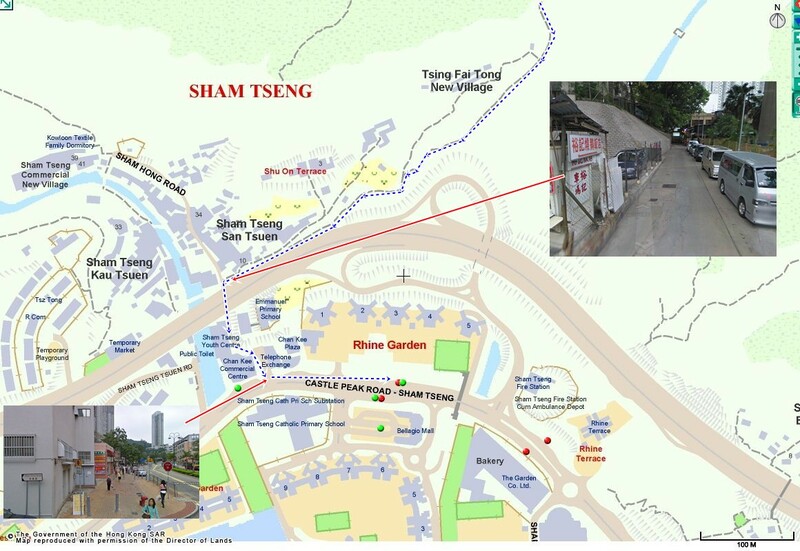 You'll arrive in Sham Tseng shortly. You may want to stop at Yue Kee Roast Goose on Sham Hong Road to sample some of their eponymous and famous roasted goose. When you are done, head to the bus stop in front of the Rhine Garden apartment buildings. There, a lot of buses routes will take you wherever you need to be. 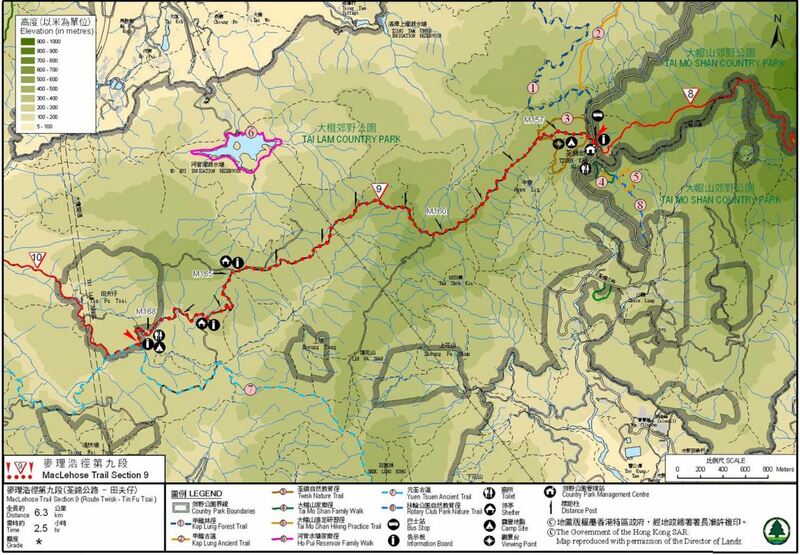 (21.9 kilometers) Between 5.5 and 6.5 hours depending on walking speed. Difficulty: 4/10. Quite easy, long as there is not way to get back between sections 9 and 10. Appreciation: 3/10. Boring, mostly paved. If you want full bragging rights for MacLehose, you gotta do it. 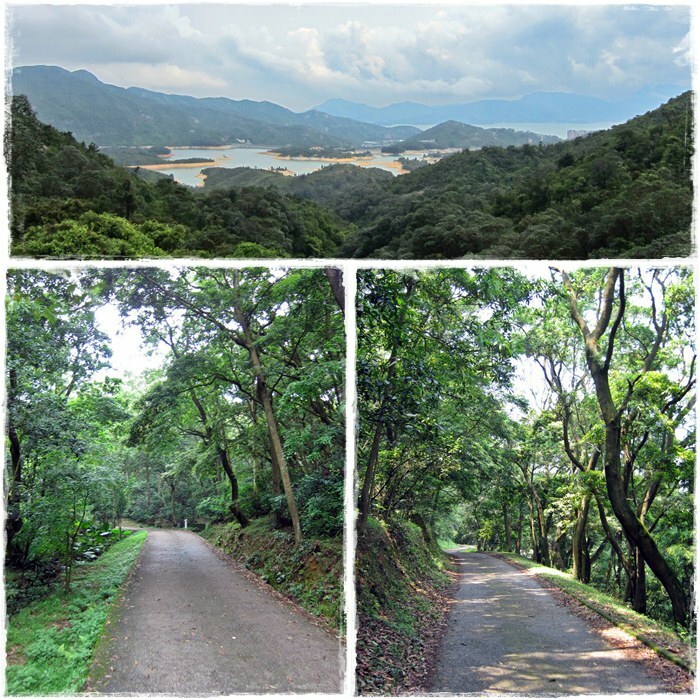 If you want to experience the best of Hong Kong trails, that is not one of them. Transportation: Get to the Twen Wan West MTR station. Exit D. Walk to the Nina Tower bus terminal (about 5 minutes). Take KMB bus 51 (http://hketransport.gov.hk). Stop at 郊野公園 COUNTRY PARK. 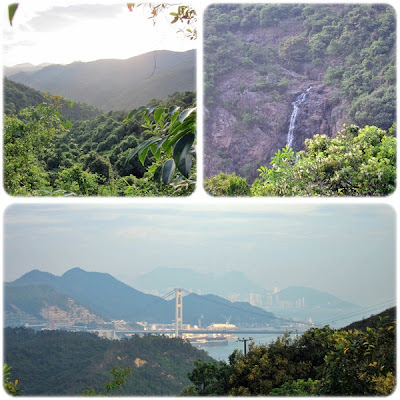 At the end of the trail, just follow my instructions to get to Tuen Mun MTR, about 500 meters from trail end. Take KMB 51 and stop at Country Park. Retrace your steps a little bit. 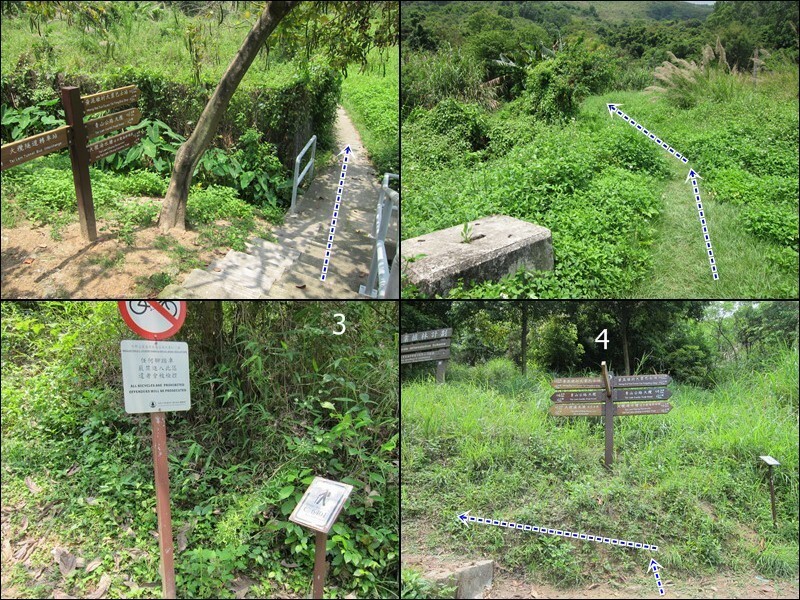 The trail head as by the big 'Welcome to Yuen Long' sign. Go past the gate, hang out right and follow the road that is going up a little bit. From there, follow the milestones posts and the little hiker signs, you should not get lost. Remember, there's one milestone every 500 meters. This is almost at the end. 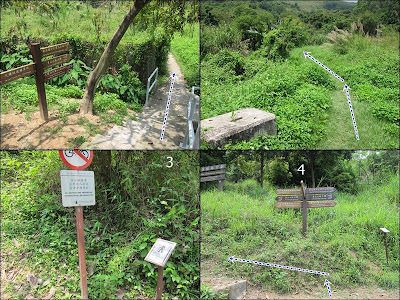 You may be tempted to use the shortcut on the left but that is not the end of MacLehose section 10. About 2 more clicks to go. You want to cross the road on the left side so you can then take the pedestrian walkway that parallels Pui To road. Once off the walkway, go underneath the highway to be on the right of Pui To Rd. 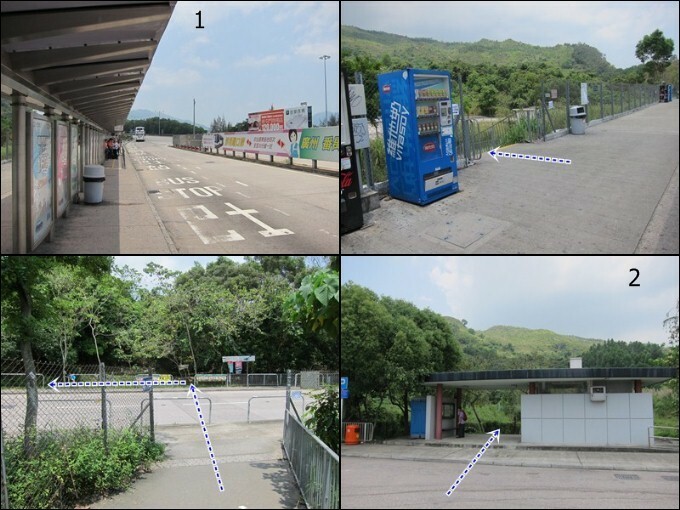 About 300 meters along Pui To, you will find the entrance to Tuen Mun's MTR.